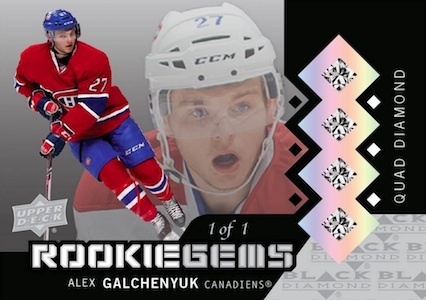 2013-14 Upper Deck Black Diamond Hockey Rookie Gems Quad Diamond Relics are some of the top hits in the set. And for once, they're a redemption you might want to actually receive. Featuring four diamonds embedded into the card, they're too big for packs. So redemptions are a given. But Upper Deck is adding a wrinkle to the redemption process to make the process interactive. Under normal circumstances, redemption cards stink. You sit there and wait. Weeks, months, sometimes years go by and you just wait. The only interaction you have with a typical redemption card is entering the number into a database and checking every few weeks to see if its status has changed. Golden tickets are randomly inserted in 2013-14 Upper Deck Black Diamond Hockey packs. Those who find one are guaranteed to get a Rookie Gems Quad Diamond Relics card. But which one won't be known until April. The cards will be picked via a live online draft, the Diamond Draft. Much like the NHL Draft Lottery, those who redeem a golden ticket will have their name written on a ping pong ball. On April 14, Upper Deck will host the Diamond Draft live and broadcast it via the Internet. To build suspense, ping pong balls will be picked in reverse order. To land the top pick, a collector will have to be the last ping pong ball. When it comes time to draft, cards will fly furiously. Collectors will have one minute to make their pick from the available cards. For those who cannot attend the Diamond Draft live, they can have a rep present in their place. If that's still not an option, the collector will get what's perceived as the most valuable card at the time. Prices will be gauged at how players are comparing with one another on the secondary market. Should a collector pull one of the golden tickets after the Diamond Draft has happened, they won't be left hanging. They'll receive a randomly selected card from what's left. 13-14 UD Black Diamond Jonas Brodin Quad Rookie Gems Emerald RC 7 25 VERY RARE!! 2013-14 MIKAEL GRANLUND UD Black Diamond Quad #234 ROOKIE RC PSA 10 GEM MINT!! !